I want to start off by thanking everyone for the overwhelming support, compassion and number of condolences on my dad’s passing. It has been a difficult few weeks both pre and post funeral and Shiva, but my family and I were tremendously comforted by so many people coming out of the woodwork with calls, cards, texts, emails, donations to his favorite charities and an amazing amount of stories about my dad, many of which I was hearing for the first time. While my writing had gone dark for the past 10 days we have been very active with our portfolios. When I left off on March 1 we had dramatically reduced our exposure to stocks just as the market was beginning it’s last little 1000 point plunge. I mentioned that we were keenly watching events unfold for an opportunity to redeploy that cash. Little did I know that the moment would come less than a day later as stocks were hammering out a bottom just above Dow 24,200. So far, both moves seem to have been very fortuitous. 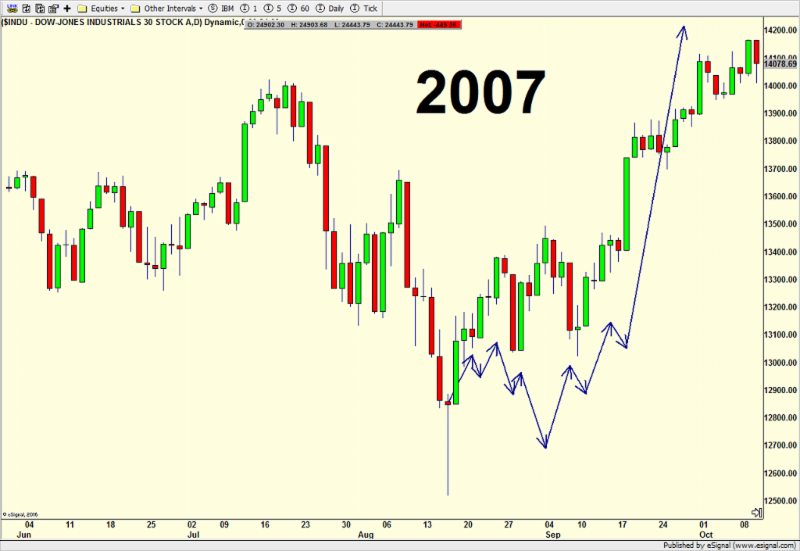 Let’s return to what has become my favorite two charts and scenarios. The first was the preferred path until I relegated it to number two a few weeks ago. 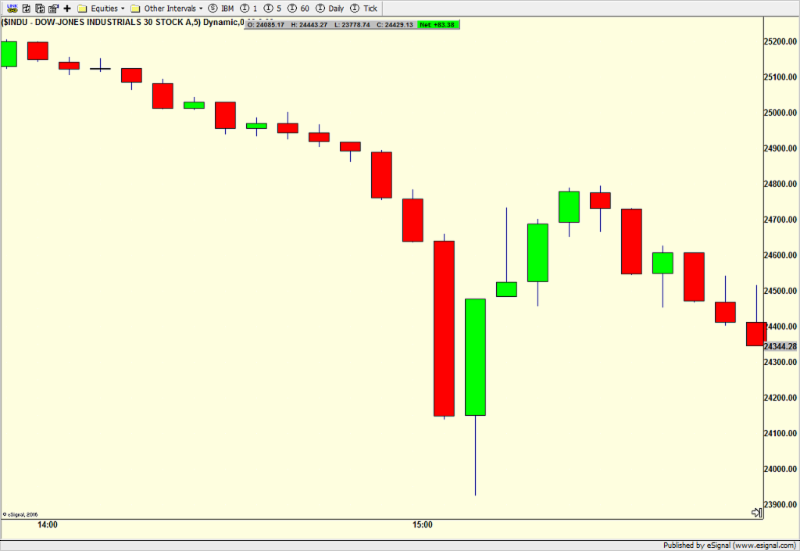 Stocks were closely following my arrows for a while. The chart above became my number one scenario and except for the latest bout of weakness going a bit deeper than thought, this one seems to be on target for now. Remember, regardless of which scenario wins out or if a new one becomes possible, I have said all along that all paths lead to fresh all-time highs for stocks by the end of Q2. I have written it here as well as pounded the table about it on Fox Business and CNBC. No wavering here. The bull market remains alive. After Friday’s dominance by the bulls and the very early Monday morning follow through, the bulls are on the verge of negating what has been my preferred scenario and instead opting for scenario number two below. Since a called the bottom a few weeks ago, I drew the two horizontal blue lines on the chart below and have not changed them at all. Those represent a trading range where I thought stocks would bounce in as volatility began to subside here and there, but remain elevated from pre-correction levels. If my preferred scenario was going to continue to play out, stocks should not close above the top of the volatility range. As you can see from the farthest right green candle, price is there right now. Should that remain the case, scenario number two moves to number one and number one becomes null and void. Lots going on today and this week. It’s time to really pay attention. As I mentioned on Friday, volume has been pretty pathetic on the rally, but leadership has been very strong. While both matter, I can reconcile these by saying that volume is more short-term than leadership. Semis, banks and discretionary all seem poised for new highs while transports have a lot of work to do to repair the damage that was done. They certainly are in no rush. Finally, there has been way too much talk from stock pundits and analysts about the bond market. That always gets my ears up. 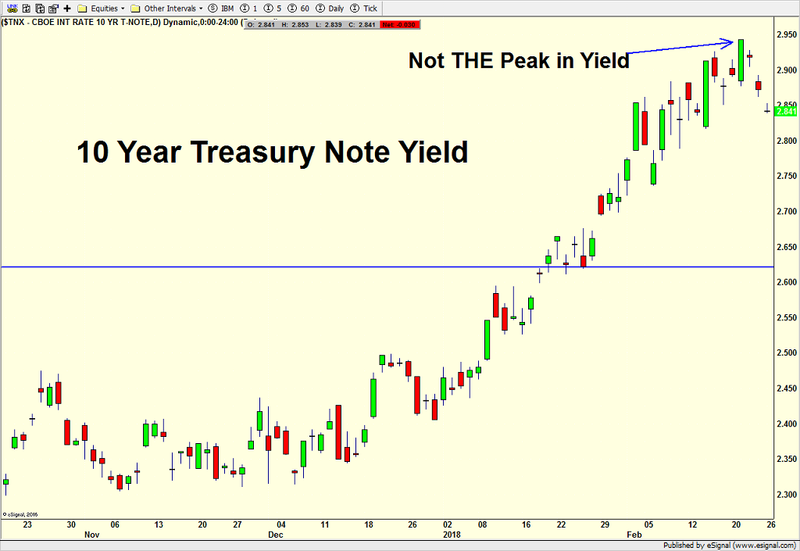 The yield on the 10 year Treasury note had soared a tick below 3% which seems to be everyone’s line in the sand. However, over the past few days, it has settled back to 2.84%. I absolutely do not believe we have seen the peak in yields yet and 3%+ will be seen and fretted about sooner than later. 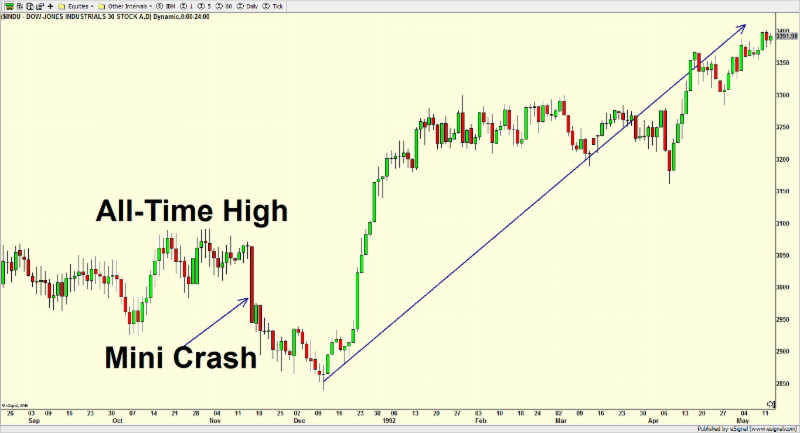 Stock Market Approaching Critical Juncture. Eyes Open! 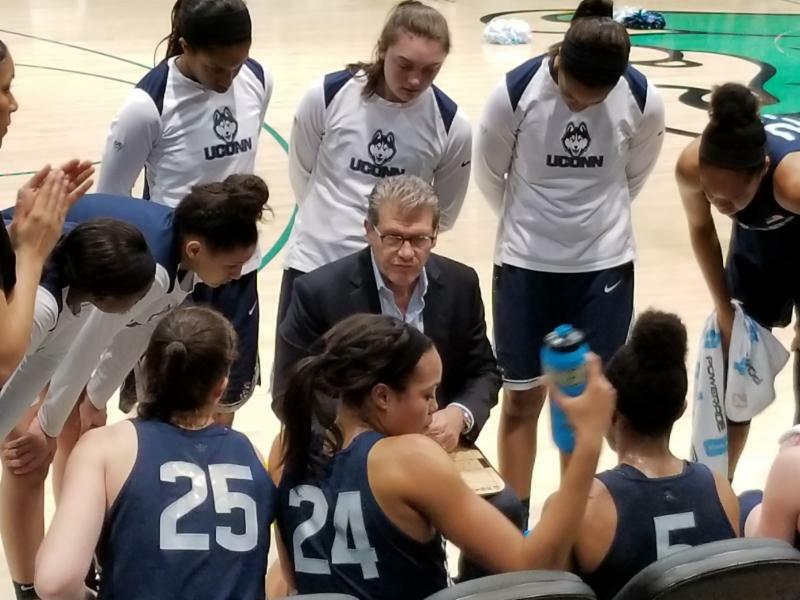 It’s Friday of a holiday-shortened week and even more so for me as I spent Tuesday and Wednesday in New Orleans with some fellow UCONN crazies eating, enjoying a few adult beverages, playing golf and watching the women dismantle Tulane, my wife’s alma mater. It was a good break from winter in New England, but Mother Nature seems to have lost her ferocity up here and it’s been more like March and April. 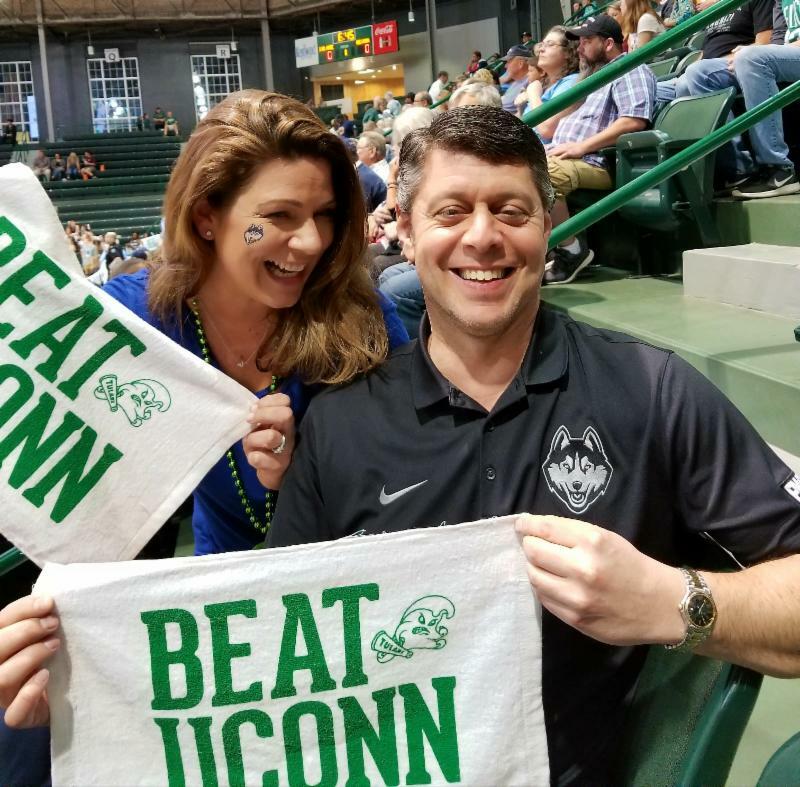 Tulane passed out these BEAT UCONN towels, so of course, we accepted ours. We took a bunch of pics holding these and all but the one below had us both looking at the camera with a somewhat normal pose. This one, however, pretty much describes our relationship. I am the jokester who starts everything and she joins in, almost in disbelief of feeding my immaturity. Anyway, the towels made great napkins for the muffuletta from Central Grocery. Before I send a full canaries in the coal mine which will be print very long because of all the charts, I wanted to send this update on what’s becoming two very familiar charts. The first one below remains my preferred scenario which calls for the rally to end, well, right about now with a return to the bottom of the volatility range in March. My initial downside target is Dow 23,000. From there, I see a very strongly rally to all-time highs with Dow 27,000 by the end of Q2 and a shot at 30,000 by Labor Day. How will I be wrong? 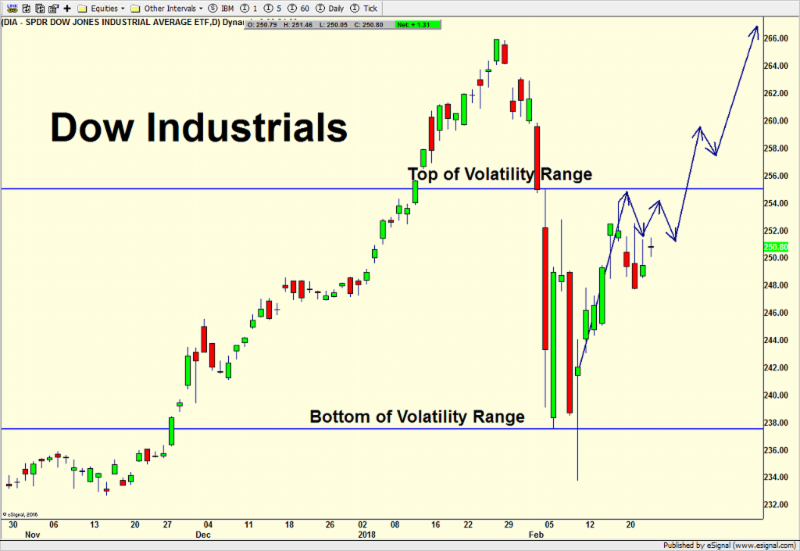 If the Dow closes above the top of the volatility range which is essentially above last week’s high, I think this scenario will move down to number two on the list. Let’s call that Dow 25,500. The other scenario I have offered is below and would move to number one if the Dow closes above 25,500 this month. This one calls for the bottom to be in with only mild weakness before closing well above the top of the volatility range on its way to Dow 27,000, all-time highs, sooner than later. Both scenarios being offered end with new highs and at least Dow 27,000. The bull market remains alive and reasonably well. If the first scenario plays out, you can bet that the masses will be calling the end of the bull market right around Dow 24,000. A few additional things of note. First, the rally in stocks has not been with enough enthusiasm. There doesn’t seem to be strong conviction. While there is no rule saying there absolutely has to, it does give me some background concern. Maybe a day where 90% of the volume is in advancing stocks is coming next month, or even two with 80%. Stocks sold off into the close last Friday, the day before a holiday weekend. That’s atypical and suggests that all is not perfectly well. However, several times I said we need to watch which groups lead the market higher off of the bottom. So far, banks, semis, software, internet, discretionary, materials, biotech and healthcare have been leading. In other words, strong “risk on” sectors which usually lead a healthy advance. On the flip side, staples, telecom, REITs, utilities, energy and transports have all lagged since February 8. The first four are all defensive in nature and healthy to lag at this stage. The last two are somewhat of a head scratcher as lower energy is good for transports but transports are very economically sensitive. Stocks are approaching a critical juncture. Next week will be key. Here is a very quick and timely update to start the week. Time to be on our toes. I will have more tomorrow or Thursday, but there may be a change afoot. Stocks did not end the day well on Friday. No big deal. They were up slightly but gave up big gains. That’s normally not unusual except that it was into a holiday weekend. That’s atypical. While the rally off of the lows has been significant it has lacked the true enthusiasm to confirm a low of importance. 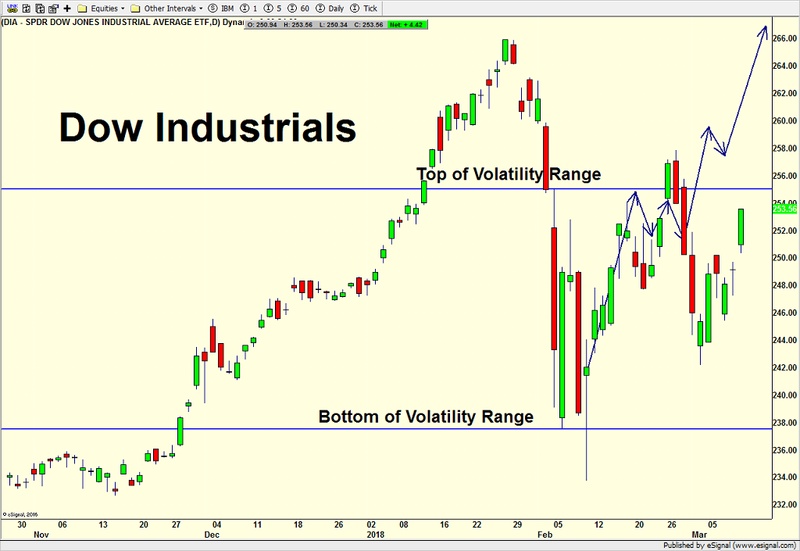 For several weeks I have offered two scenarios for the market to take, both ending with Dow 27,000. However, as counter intuitive as this may seem, the more bullish scenario has the rally ending or over. Friday’s action should be viewed as disappointing but you won’t hear much of that in the media or from the pundits. There is a good chance the rally may have ended. That’s the assumption I would begin the week with. How will I know if I am wrong? For now, if the Dow closes above Friday’s high, that will signal the rally should continue. Until that or unless that happens, it’s time to play some defense and not stick our necks out. I had hoped to have a full canaries in the coal mine done today, but I failed (or lied as some could say) as I am only half done. It’s okay, though. Stocks are behaving exactly according to the footprints I first offered 10 days ago, making life a little easier, for now. And regardless, I am still forecasting Dow 27,000 next quarter with the chance of 30,000 later this year. 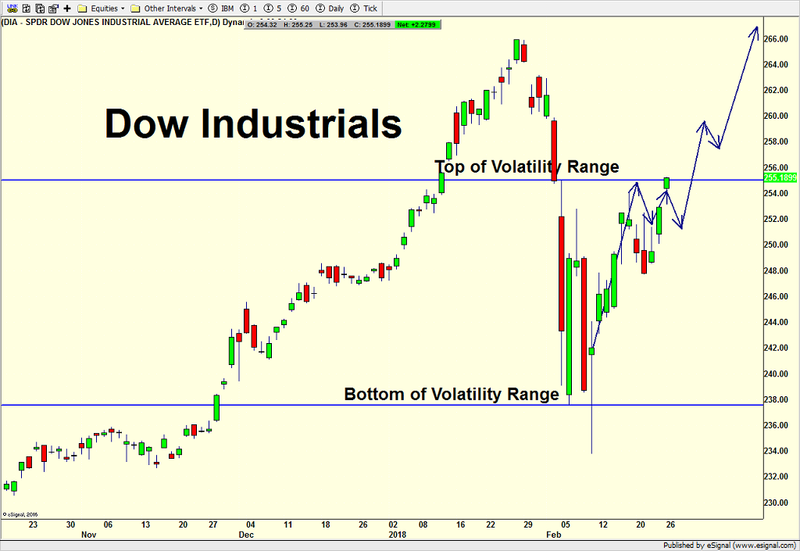 Below you can see the original chart with the Dow rallying smartly and heading towards the top of the volatility range I labeled with the blue horizontal line. Whether it goes a little north or a little short of it is irrelevant. From there, it gets dicey as stocks are “supposed” to peak and see a healthy decline to the bottom of the volatility range in March. If that ends up occurring, I would fully expect momentum to be weaker than the recent decline, less stocks making new lows, lower volume, lower volatility and less panic. Just for the fun of it, I converted the chart above to a line graph below which only shows closing values of the Dow. It’s a less less noisy and perhaps easier to understand without the intra-day swings and colors. Below is that scenario with the potential footprints. Stocks still rally to the top of the volatility range, pause for a week or so and then head straight to all-time highs, probably in April. The stock market always needs a solid foundation to keep rallies alive. Imagine a house where you remove 25% of the concrete or half the framing rots away. The house becomes less and less stable before a storm knocks it down. In this case, a run straight back to new highs could look a lot more like August 2007, July 1990 (click on that link above) or another instance where a 20% or more decline is more likely to unfold. That’s certainly not what the majority wants to see, but it a possibility. Again, that’s not my most favored scenario and regardless, I think new highs are on the way in Q2. A Friday Bottom Is In! People seemed to like starting with the conclusion, so let’s do it again. Just as I was hitting send last Friday, the stock market began to rescue itself from the depths of despair for the second time in one week. That was right about the time so many pundits and reporters were boldly stating that stocks never bottom on Fridays, which was something I debunked last week. And as is often the case on a Friday to end a volatile week, traders reduced risk, causing stocks to accelerate higher into the close. In this case, people covered their shorts or bought back the stocks they sold in hopes of seeing more weakness. That buying fed on itself the rest of the day. 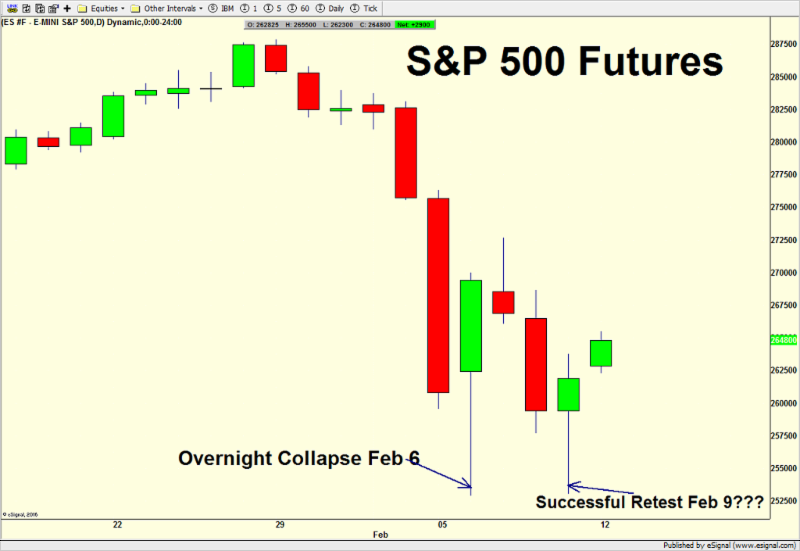 The chart below shows the S&P 500 futures which are a derivative of the popular S&P 500 index. They almost always trade in lock step, except that the futures trade outside of normal business hours from Sunday at 6pm to Friday at 5pm. Essentially, the futures are a way to give traders and investors more access as well as on a leveraged basis, meaning that one can put up a fraction of the total cost of the investment, similar to putting 20% down on a house but getting the full control and upside. As you can see, the futures spiked down on February 6 in the middle of the night, but that was not seen during regular market hours. On Friday during the day, the futures sold off and revisited those same levels from the overnight, did not decline further and began to rally back. That can be called a successful retest which would lead to additional rallies. That is what is supposed to happen this week. Stocks should remain volatile, but the bulls should enjoy some success. The opportunity for the bulls is also supported by a plethora of short-term studies which all point to a bounce as they have since last Monday. Below is the volatility index, better known as the VIX. 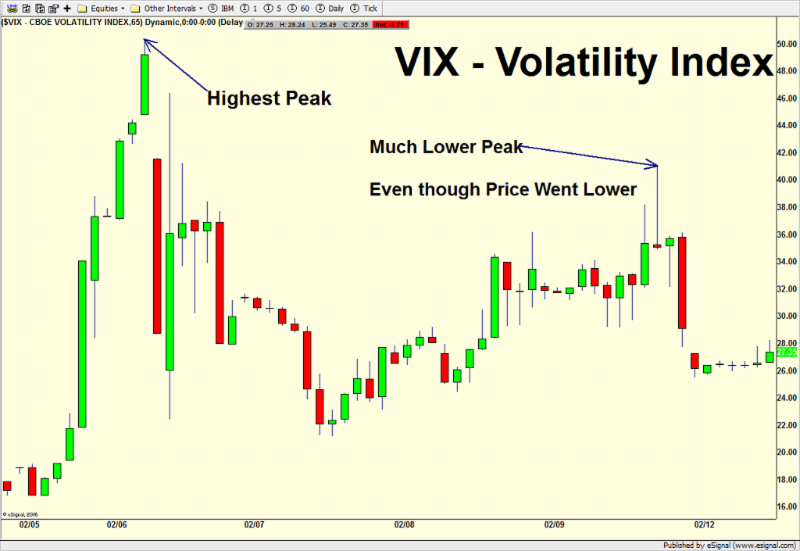 What’s important to understand is that last Monday, the VIX spiked to 50 as stocks cratered. 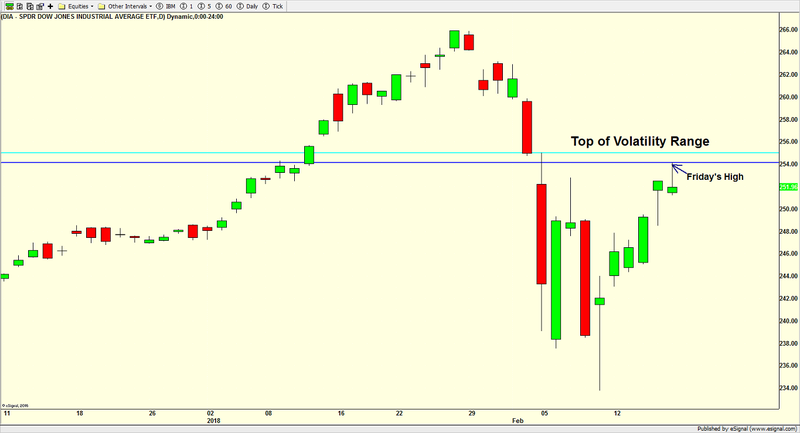 On Friday, as stocks were falling again and at lower levels, the VIX should have been well above 50. However, it saw a lower peak at 42, indicating that downside momentum in stocks was abating. I don’t think Monday is going to be one of those “key” market days. After a dramatic reversal like we saw on Friday, we could see stocks follow through and rally, the most bullish scenario. Or, they could back and fill, chop around all day before moving higher on Tuesday or Wednesday. The real key is to see which sectors bounce the most. We definitely do not want to see the defensive groups like utilities, REITs and consumer staples lead any rally. Updating a chart I first drew early last week, we see that stocks are basically staying in the road map. But they are coming to a point where the bulls need to step and rally. I still believe stocks will move higher to a secondary peak later this month and then decline again in March before the real move to all-time highs gets going in April. This also fits in with research that shows when stocks decline 10% intra-month, they do not recoup those losses immediately. Rather, they do rally in the short-term, but typically close the month down 5-8%. And 5% down months usually see some more selling the next month, March in this case, which further supports my forecast. Hat tip to Rennie Yang of Astrikos Research. What If I am Wrong?!?! A very long market week is coming to an end. Stocks could not hold on to the rally on Wednesday morning which led to spillover selling on Thursday that accelerated sharply into the close. After a decent morning for the bulls, sellers came in again into lunch on Friday and it looks like the market will need another reversal set up to stem the tide. That could include another ugly morning on Monday or Tuesday, but doesn’t necessarily have to. Pundits often say that stocks never bottom on a Friday, but that’s false. There are very few “nevers” in investing. 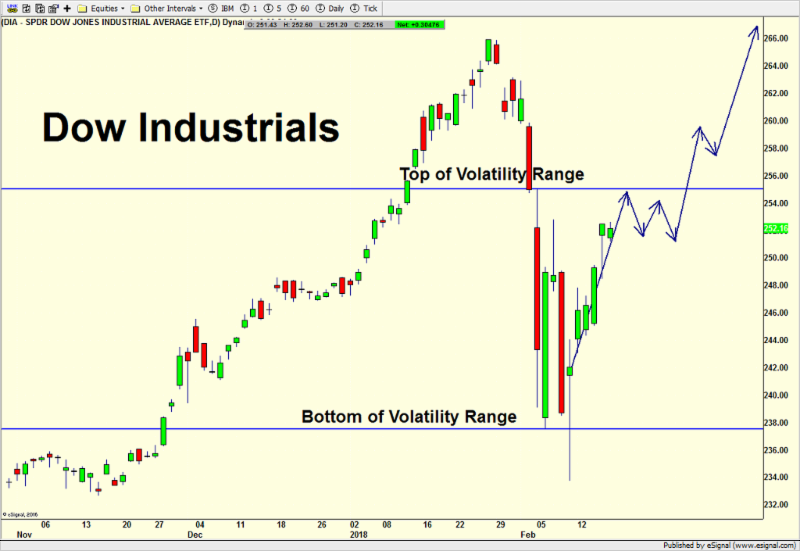 The truth is that the stock market rarely sees a low heading into a weekend. I think the number is either 8% or 10% of the time. 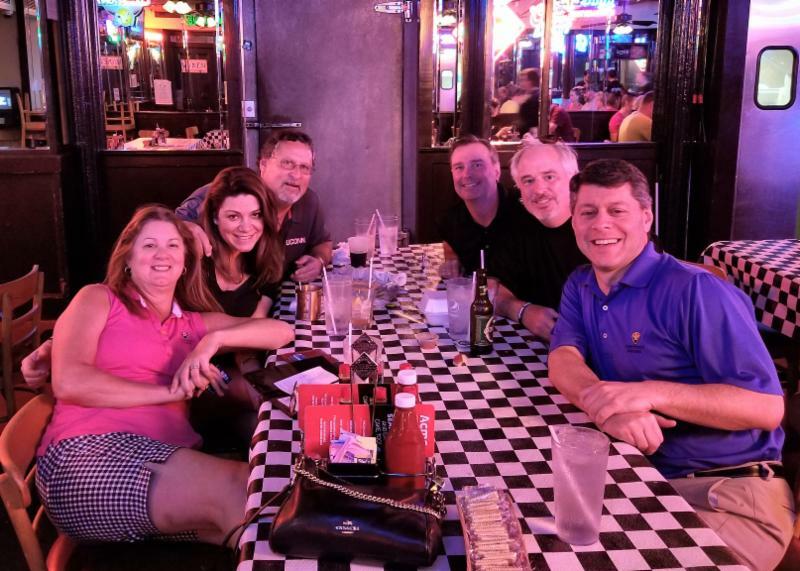 The post 9-11 bottom was on a Friday, something I will never, ever forget as I was having my second bachelor party trip of the month and trying to balance the markets with the fun. Waking up to indications of a 600 point (7%) down opening was not what I had in mind when we planned the trip to Kohler Wisconsin! Anyway, getting back to this week, while volatility has been well within historical norms, it’s so far out of the range we have seen for the past 18 months. That’s why it “feels” so large. And as I have been saying, it should remain volatile for some time, even on the way back up. During the course of the week, a number of people contacted me with their own market scenarios. I always welcome questions, comments and disagreements. Feel free to call, email, Tweet or Facebook message me. I heard everything from a 20,000 Dow point decline, worse than 2008 with global armageddon to the correction is over and the bull market will continue for years to come. That’s what makes markets. Very differing opinions! That’s a question I ask myself every single market day although I twist into “how am I going to be wrong?” In other words, what am I missing or assigning too much weight or not enough weight to? With 29 years of battle scars, I have been wrong before and I will be wrong again. It’s okay to be wrong. It’s not okay to stay wrong. There are a number of ways I could be wrong as with any market forecast. The bull market could have ended, last month. The decline’s magnitude could be much greater. The ensuing rally could be the last. I am going to table the possibility of the bull market ending until next week when I plan to do a full canaries in the coal mine, which, for newer readers, is my way to lay out the evidence of how bull markets have died in the past. Spoiler alert. The conclusion will be that the bull market is not dead as we haven’t seen the dead canaries. In other words, the footprints of a bear market are not in place. Could I be wrong on the magnitude of the decline. Well that’s an easy one to answer. Of course! I have always found downside targets to be much more difficult to forecast than upside ones. When the stock market has these vacuums or pockets of illiquidity, the major indices blow through most conventional, common sense levels. Quickly combing through my database, I noticed two significant declines where stocks did not back and fill to repair damage before rallying over the intermediate-term. Better put, times where stocks did not build a solid foundation for a sustainable rally. 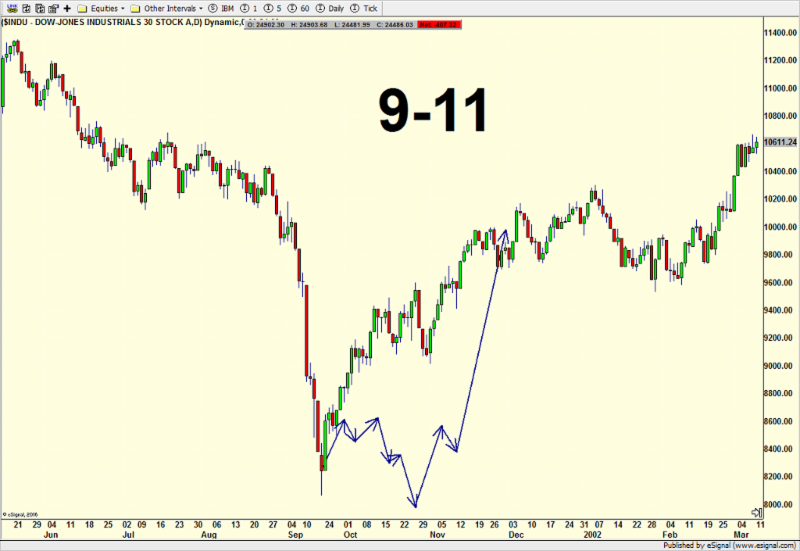 One was the bottom after 9-11, seen below. 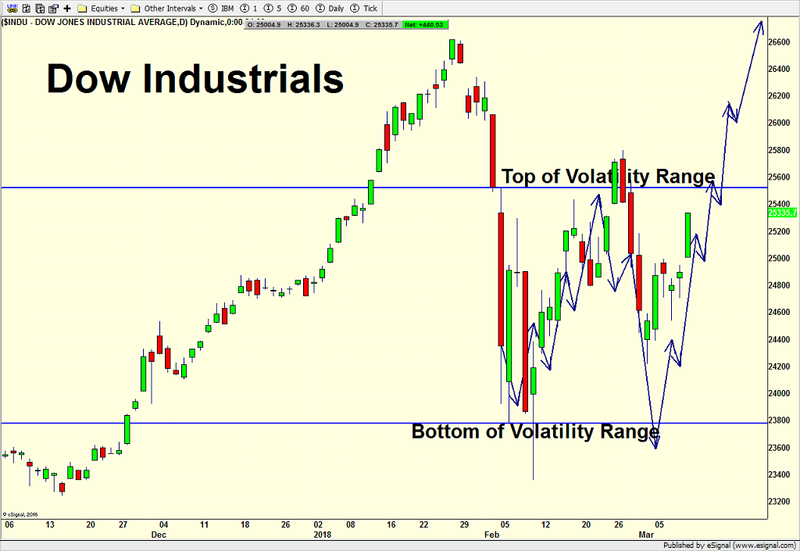 Stocks were already in a bear market when 9-11 occurred and behavioral patterns are very different in bear markets. Market bottoms are simple and don’t build solid foundations, which is why price remains in a bear market. That’s not what we have today. I added my famous blue arrows to show you what good, bull market behavior would have looked like back then and put an end to the bear market. The other period I found was in the summer of 2007 as shown below. 2007 was very interesting as stocks soared to all-time highs in July and corrected 10% into August with outsized volatility. There was a simple bottom on one single day without any backing and filling to build a solid foundation as the blue arrows show. Stocks then roared to all-time highs and the final bull market high in October. This scenario is certainly possible today although I still rate it as less likely than the one I have been discussing. We will see how things unfold over the coming few months and assess. Stocks are setting up for another very volatile week next week and I will be in touch as warranted, but you can definitely expect a full canaries in the coal mine. As always, please don’t hesitate to call or email with any specific questions about your portfolio or financial situation. Investing is a marathon not a sprint and pockets of weakness in the markets will always occur, whichever side of the market you are on. 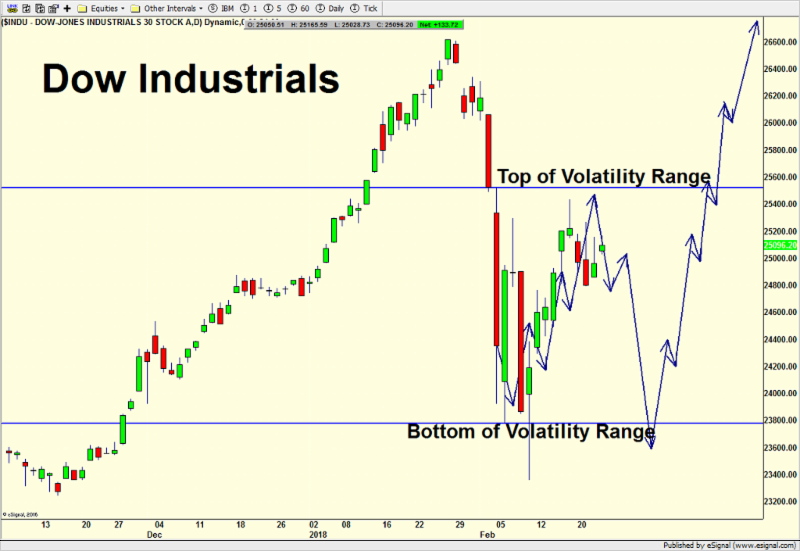 My last two updates focused on the stock market’s mini crash and the reliable historical pattern that typically ensues, including what I saw as the somewhat predicable Turnaround Tuesday where stocks reverse early losses after selling off sharply on Friday and Monday. I was looking for that “woosh” lower early Tuesday and while down 600 wasn’t the magnitude I wanted to see, it was enough to flush out the remaining sellers and entice some buyers in. The worst may be behind us, but the is not over. You can read those updates below. As I mentioned previously, short, sharp market downdrafts from all-time highs have not led to bear markets nor major declines. They are scary “market events” where the volatility Genie exhibits chaotic behavior for an extended period of time. She doesn’t just go right back into her bottle. 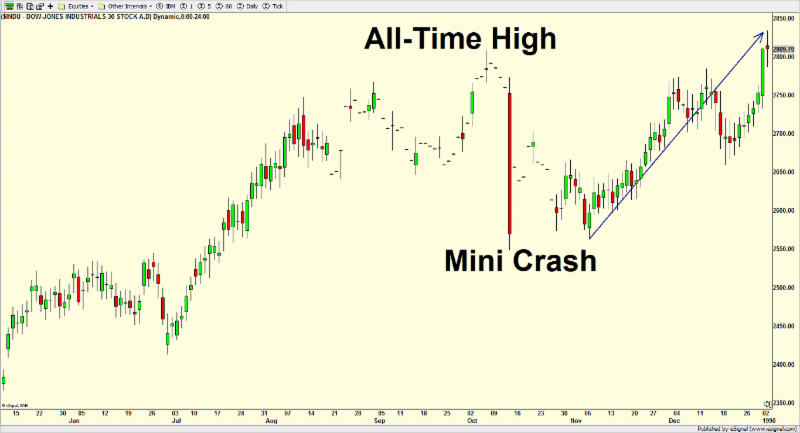 In this case stocks saw a mini crash, more in point terms than percentage. Intra-day moves were extreme, are extreme and will continue to be extreme, likely into April. Investors should get used to triple digit moves every day with bi-polar behavior. Again, we have probably seen the worst of the volatility but it’s certainly not over. Eventually, things will settle down. Let’s revisit my most likely scenario chart below with the arrows redrawn to line up with the magnitude of the move. First, look at the two horizontal blue lines which represent the short-term trading range I see setting in, bound by the two most volatile days’ high and low. Stocks should bounce between 25,500 and 23,800 into March at the latest although they could compress this scenario and have it end this month. Weeks down the road, the stock market is likely to see another decline towards, at or just below the worst levels from Tuesday morning. However, that decline should come with much less acceleration, volume and participation. 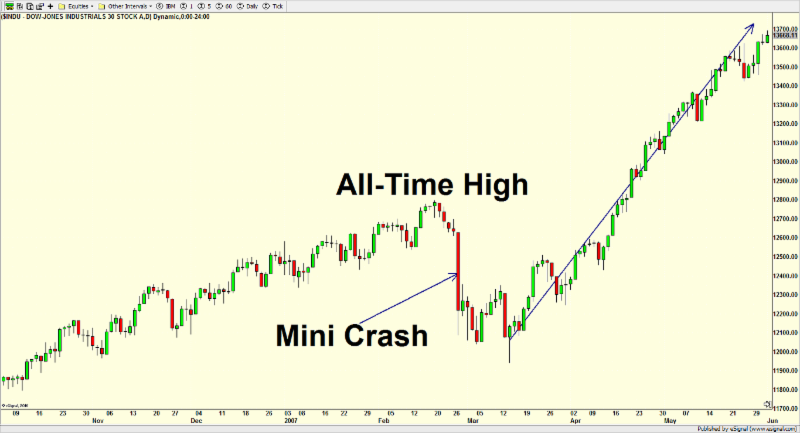 Assuming the market holds there, a multi-month rally to all-time highs will ensue. I am going to do something different today and start with my conclusion and work somewhat backwards. The bull market remains intact and fresh all-time highs should be seen next quarter. Buying into sharp downdrafts, while emotionally very difficult, should be rewarded over the intermediate-term. Like a snowball rolling downhill, whatever this decline is going to end up being labeled, the market is right in the middle of the highest speed and maximum acceleration. As with the snowball, it is the largest and fastest right before it hits the bottom of the hill. If Friday wasn’t volatile enough for you, Monday was a wild one in terms of points not percent. And that’s leading to what looks to be an equally or even more volatile affair on Tuesday as opening indications have ranged from the Dow being down anywhere from 400 to 950 points. In point terms, it’s going to be a day for the ages. However in percentage terms, Tuesday will likely fall within the realm of normalcy for a market decline. This next comment may seem counterintuitive, but the best thing for stocks would be a 1000+ point decline at the open that creates the “whoosh” of cleaning out everyone and anyone looking to sell. From there, the market would then have an opportunity to back and fill and begin to create some stability. If that “whoosh” doesn’t happen at the open, there should be several selling waves during the day to create it with the potential for a Turnaround Tuesday this afternoon. The media would absolutely love it. The worst thing for stocks would be if stocks open sharply higher. Yesterday, I wrote about my playbook for mini crashes. 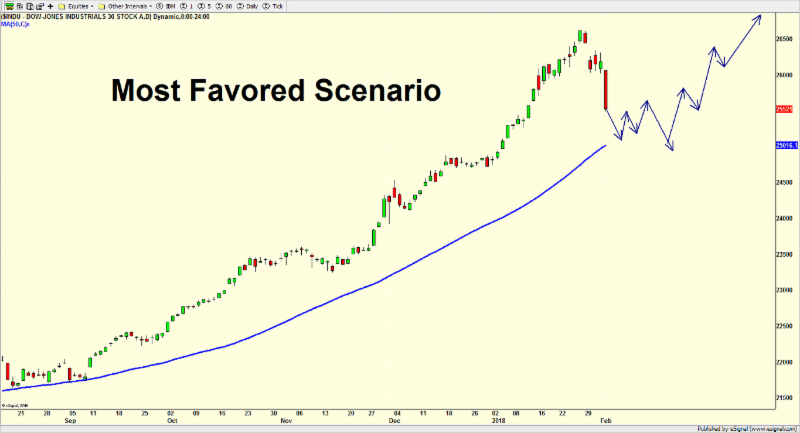 http://investfortomorrowblog.com/archives/3313 The pattern and most likely scenario remains very much in play and valid although I certainly underestimated to magnitude of the decline. As I mentioned yesterday, I am looking for the momentum or internal low in the stock market this week followed by a multi-week rally before the next decline to the ultimate bottom takes places. If the market cooperates, that puts the final low sometime in March. There are enough “ifs” and time in that scenario to take it day by day and week by week. One thing continues unabated, volatility, my theme for 2018. 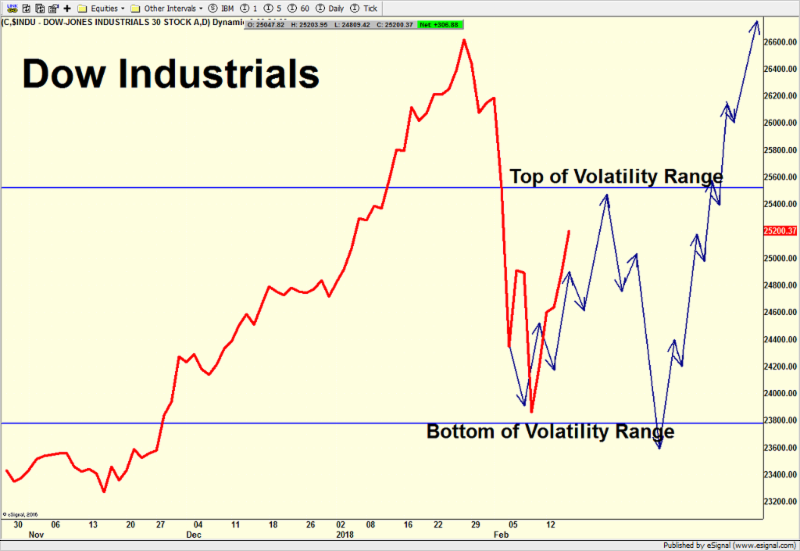 Historically average volatility is here to stay with pockets of spikes. Investors and the media have this fascination with needing to know why the decline occurred. What caused it? How can we prevent it from happening again? Most of the time, that’s a fool’s errand. What we are seeing right now is financial market event. It is not fundamentally based and is absolutely nothing like 2008, which people have invoke during every single large decline since 2008. There is no underlying financial crisis. The economy is not teetering on recession, at least not yet. We have record corporate earnings and the global economy is sound, again, for now. At the risk of creating some undue anxiety, 1987 was a market event. It had nothing to do with the economy or financial system. I do not believe this is 1987 again. I repeat. I do not believe this is 1987 again, at least not right now. I do think something like 1987 on a smaller scale could occur much later this year, but that’s a topic for a different day. This stock market decline began with the specter of higher interest rates, or at least that’s what the pundits have said. It took the 10 year treasury note to rally 100% before stocks noticed or so it seems. Last Friday, wage growth finally got back to normal levels, if only for one month. This has investors worried that a tight labor market with rising wages could lead to inflation, something we haven’t had in over a decade. And with inflation comes a very restrictive Fed with spiking short-term interest rates. I laugh at that entire thesis. Certainly since 2009, the Fed has been desperately trying (and failing) to engineer inflation. The inflation isn’t even out of the bottle yet and people are worried. Looking at the long-term picture, since 1998 the velocity of money, something I write about every 6 weeks right before the Fed meets, has been in a perfect, secular bear market. I continue to argue that until velocity turns significantly higher, there will be no problematic or worrisome inflation. Another reason behind the selling has been computerized trading, as it behind every single accelerating decline. That’s a sign of the times and one of the unintended consequences of technology. People don’t complain about high speed trading on the way up, only on the way down. If I had my druthers, I would slow down all computerized trading by 1/2 of one second. Playing field leveled. Edge removed. Look at the chart below, especially in the middle, of what transpired over just two hours on Tuesday. 1300 Dow points from high to low. 600 Dow points in just 5 min, in both directions. Finally, as with almost every decline, there are those out there who made overly leveraged (borrowed money) bets and who are at risk of insolvency. In today’s case, what started as tens of millions and then hundreds of millions and billions and tens of billions, betting against stock market volatility became akin to shooting fish in a barrel, until it wasn’t. Volatility happens all at once. It doesn’t quickly and methodically build. There are derivative products who trade the volatility index or VIX, both with and against. Those that bet against volatility have blown up. completely. So much, that at least one product creator, Credit Suisse, is liquidating its XIV exchange traded note (ETN). XIV closed on Monday at 99. Now it’s been halted from trading and will be closed, literally overnight. There are always casualties during periods of market stress. Leverage used properly can aid in portfolio construction. Leverage used without understanding the product and consequences is greedy and ignorant. Assuming Tuesday is another wild day, (Turnaround Tuesday? ), I will send a short update or a full canaries in the coal mine later this week. The Dow Jones Industrial Average “crashed” 666 points on Friday, at least that’s how the media portrayed it. And it’s on track to open another 1%+ lower this morning. In 1987, 666 points would have been more than 25%. In 2018, that’s all of 2.5%. 2.5% moves used to mostly occur monthly and certainly quarterly. During extreme periods of volatility, like 2001, 2002, 2008, 2009 and 2011, a 2.5% move would barely get noticed. Today, it’s BREAKING NEWS. Recent volatility. For 24 months, stocks have been in their least volatile period of all-time. In 2008, investors got used to these outsized moves. In fact, we even saw a 10% move in a single day. Today that would be more than 2500 Dow points. However, since February 2016, the stock market hasn’t even declined 5% which will end this morning. And it’s been the longest streak in history without even a 3% decline. So Friday’s mini crash (in points not percent) is somewhat of an outlier, a number that doesn’t really fit in the normal range of daily returns. More importantly, it occurred from new all-time highs five days earlier. Please re-read that sentence as declines like this do not typically happen so close to all-time highs. 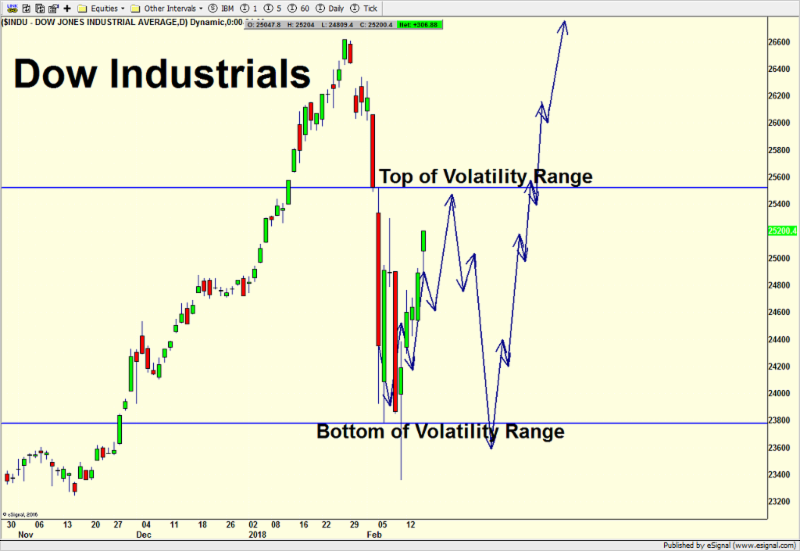 The chart below shows you what’s happening with the subsequent ones indicating a theme. The next chart below is my favorite and one that I think is the best rhyme. It’s from 2007 when stocks collapsed at the end of February due to China’s market plummeting. The reasons do not matter. I repeat. The reasons for these declines are of absolutely no significance. 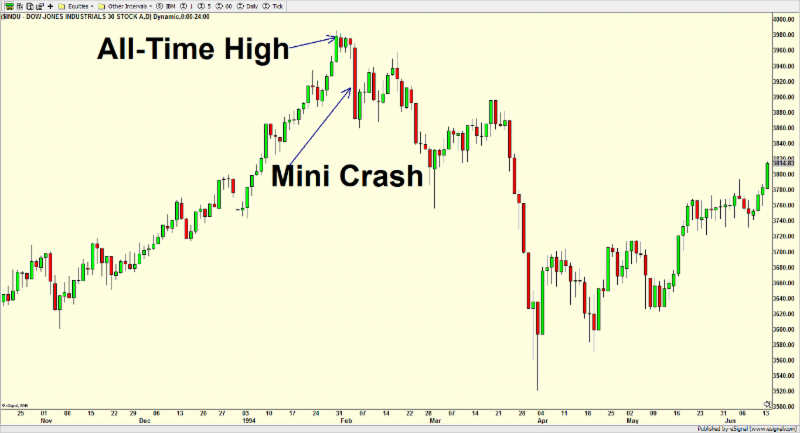 In 2007 stocks made an all-time high and then saw a mini crash five days later. 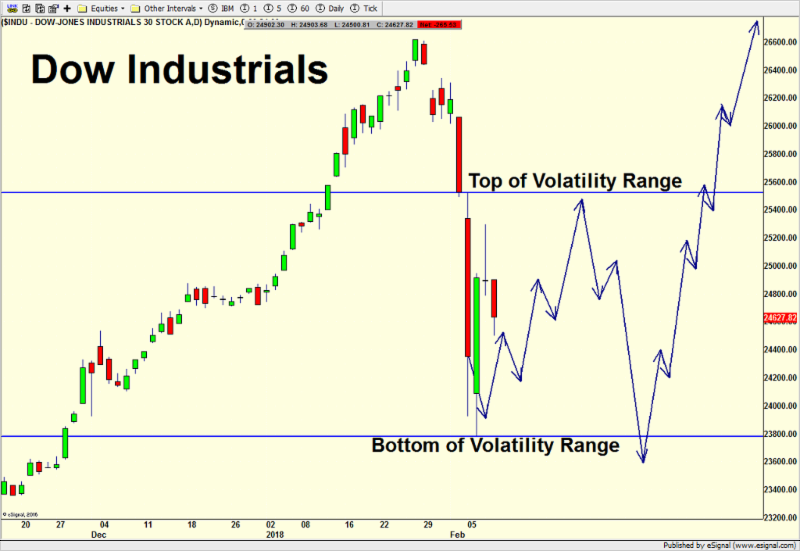 Stock market internals were very strong before the decline. In math terms, it was a five sigma or standard deviation event. In other words it was a huge decline relative to the normal price behavior over the past year, just like today. While the mini crash wasn’t the absolute bottom, it was pretty much most of the price damage. Stocks saw a short-term low a few days later, rallied and revisited that low shortly thereafter. And then stocks soared higher again. In 1994 as you can see below, stocks were at all-time highs and saw a mini crash four days later from a period of very low volatility. But that was just the beginning of a larger decline and more challenging period. Why show this? Was anything different? There was a significant difference. In 1994 stock market internals were poor and had been deteriorating for months. The January 1994 peak was accompanied by a wide ranging group of divergences or non-confirmations. The market’s foundation was already crumbling, very much the opposite of today. 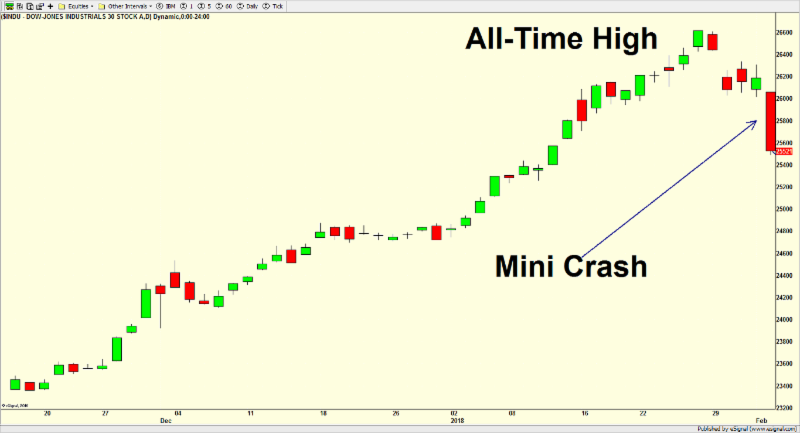 1991 is next and as with the previous charts, we have an all-time high followed by a mini-crash two weeks later. Market internals were strong before the decline. The ultimate low took a little longer, but the results were still the same. Stocks bottomed and then soared to new all-time highs. 1989 is the final comparison and although my data provider clearly has some incomplete data, I think you can get the gist of it. Stock market all-time high, mini crash a week later, rally, revisit and then stocks soar to all-time highs. Markets never exactly repeat, but they certainly rhyme. Below you can see what I drew in as the scenario I see as most favored or likely at this point. Stocks are not done going down and they should continue lower early this week. 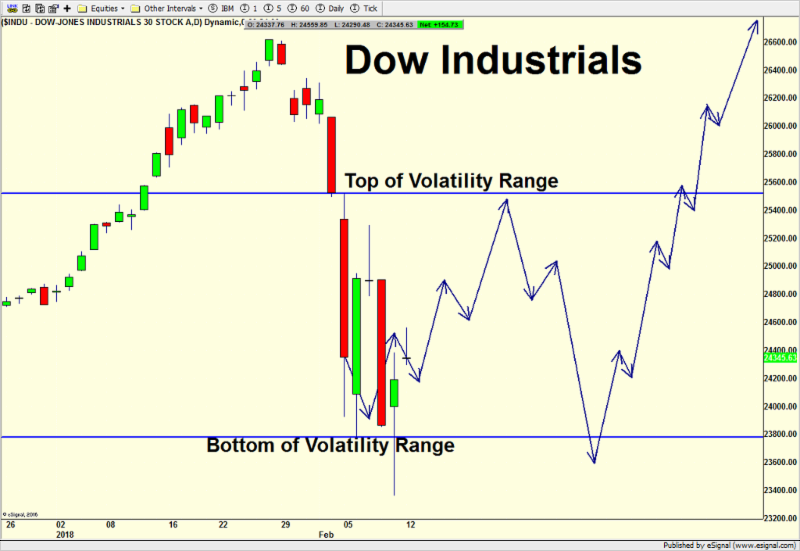 A low should be formed, followed by a bounce of one to three weeks before the decline to the ultimate low takes place. The key is not that the Dow exactly follows my arrows, but that once the low is in, stocks soar again. Yes, stocks soar again to fresh all-time highs and the bull market remains intact. The bull market is not over. This decline could speed up its ultimate fate, like it did in 2007, but that’s way too early to state right now. Besides valuation, which is a horrible timing tool and sentiment which was certainly euphoric but can be corrected with this mini crash, stocks have done nothing wrong to indicate the bull market is over or even close to ending. Ignore the hysteria and focus on reality. Buying weakness remains the correct strategy until proven otherwise.